It’s a truth universally acknowledged that kids hate their parents’ music, or at least do their best to ignore it. Garage bands don’t borrow CDs from their parents so they can practice disco covers. Unless it’s in some kind of ironic hipster way. There’s nothing ironic about the music being played in one particular suburban garage near Oakland, Calif. 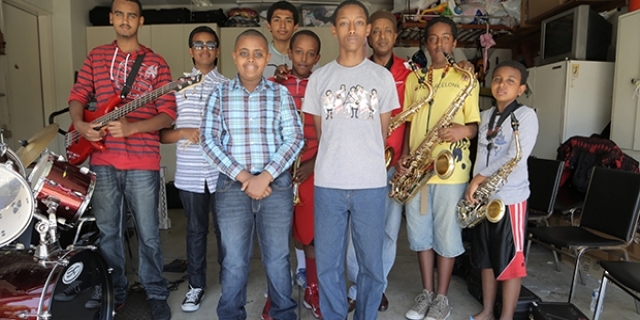 The Young Ethio Jazz Band are teenagers who rock out with their parents’ music. The band played its first gig in San Francisco last winter. Now it’s slated to open for another act at Yoshi’s, a famous jazz club in San Francisco, and then it plays in the Ethiopian Heritage Festival at Georgetown University in Washington, D.C.
All of the kids are second generation Ethiopians between 11 and 16 years old. Before they started playing together a year and a half ago, most of them had the stereotypical reaction to their parents’ music. Then he started practicing an Ethio-jazz song in his high school band. Yonathan Wolday had a similar revelation. He’s a tall, lanky 16-year-old who plays trumpet. Wolday is wearing a gray sweatshirt with a picture of a diamond and the letters “DMND.” A pair of white ear phones hang out from his collar and onto his chest. His parents are from Ethiopia, and the songs they listen to are in Amharic, the official language in Ethiopia. Wolday doesn’t understand it well, and that initially turned him off from the music. He didn’t really start listening to the songs until he began playing in the band. Even now, it’s hard to believe he’s channeling the music of his parents’ generation. Whenever the band stops practicing, you can hear simple rap bass lines pulsating out from his dangling ear buds.